The other day, I passed the Ladies Bikur Cholim and tried to look inside. I’ve always known a little bit about Bikur Cholim: it is an all volunteer organization that helps the poor and the elderly. I knew that it provides free services not only to community members in need, but also to the sick outside of the community. They fill refrigerators in hospitals full of food and provide all sorts of services to those in need. I’ve often heard that if there’s ever a way the Hasidic community reaches out, it is through the Bikur Cholim. It is really an exceptional organization. Since I wanted to know more about how it works and what goes on inside, I tried to look around. A kind gentleman offered to show me around inside. The Ladies Bikur Cholim is mostly a giant kitchen with a little office at the front. Where I came in, there were giant uncut loaves of marble cake. I asked about them, and the woman at the desk said that they were baked by the women in the neighborhood. Both Hasidic women who were working there said they do the work strictly on a volunteer basis. 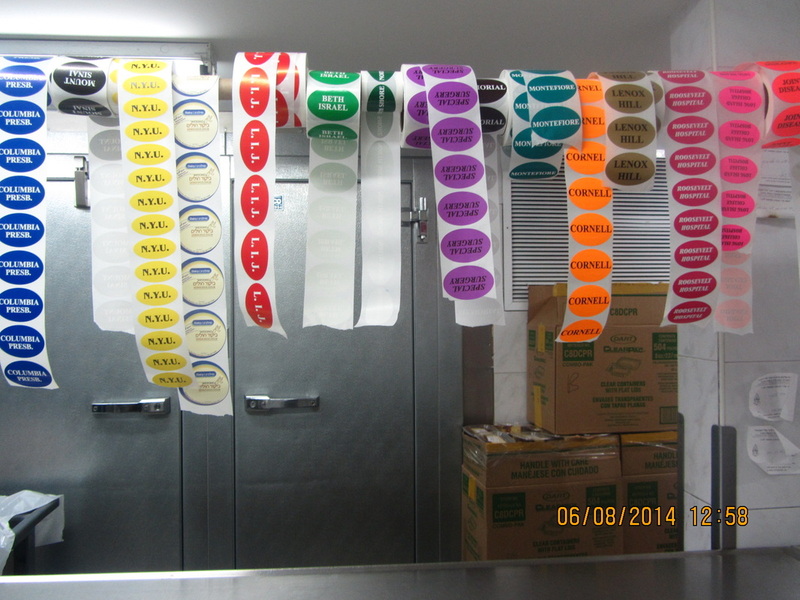 The woman who cooks prepares kosher meals for shabbes and labels the shipments with stickers, to identify which hospital each shipment needs to go to. As you can see, they go to Columbia, Mount Sinai, Cornell, NYU, Beth Israel… All the major hospitals. There is even a “special surgery” category. There was also a large rack stacked with dinners for the elderly. Those I was told are sent to seniors in Williamsburg, Boro Park, Flatbush and even Manhattan. Often the aides come to pick up the food for the seniors that can no longer care for themselves. I was also told that only the Ladies Bikur Cholim has a kitchen because the women do the cooking. The gentleman who showed me around told me that Bikur Cholim was created by the Satmar Rabbi Joel Teitelbaum and his wife some sixty years ago (this was a point of debate between the man and the woman and they at last agreed it was sixty years) and that all the Bikur Cholims that are around today are the products of the Satmar Rabbi’s and Rebbetzin’s original efforts.